Here you can find the options you can add to your Suit. TONFLY LOGO 1: 7 cm. TONFLY LOGO 2: 7 cm. 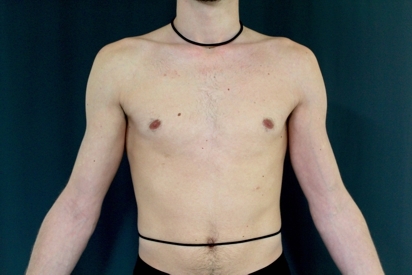 HORIZONTAL RIGHT TORSO: 10 cm. VERTICAL RIGHT TORSO: 25 cm. HORIZONTAL LEFT TORSO: 10 cm. VERTICAL LEFT TORSO: 25 cm. HORIZONTAL FRONT RIGHT THIGH: 12 cm. HORIZONTAL FRONT LEFT THIGH: 12 cm. SIDEWARD RIGHT THIGH: 25 cm. allows us to build a more precise product and minimize the risk of incorrect fit. only until the end of the calendar year. Customers are responsible for submitting updated measurements, when these are older than 1 year. Place measuring tape at string around neck. Extend it over the shoulder and elbow to the wrist bone. Measure the length between the two armpits points marked in the pictures. Make sure that the cord around the waist is still at navel height ad horizontal. Extend the measuring tape from the neck cord to the waist cord being careful that the measuring tape copies the body. Make sure that the cord around the waist is at the navel height and horizontal, extend the measuring tape from the hollow spot at the base of the neck to the navel (front waist cord). Make sure the cord around the waist is still at navel height and horizontal. Measure from the navel following down between the legs up to the center of the rear waist cord. IMPORTANT: There should be no slack in the measuring tape. Measure from the hollow spot at the base of the neck, around the crotch, to the center of the rear neck cord. VERY IMPORTANT: make sure the measuring tape is flat against the body has NO slack. Keep your legs 30cm apart. Sit on a table and make sure that the cord around the waist is still at the navel height and horizontal. Keeping the back straight, measure from the waist cord down to the table. In standing position, measure the circumference around the instep of the foot and the heel. How to check you have correct measurements ? PLEASE PAY ATTENTION TO THESE CHECKS! It's mandatory that these checksums are correct because the system will check them and if they're not you will not be able to go on with the configuration save. If so the system will alert that you have to come back here and correct the related values before to save your configuration. It is important that take all measurements undressed. Using the cord is an easy way to precisely measure otherwise difficult areas of the body. Have a friend help. Position the first cord around the base of the neck, as shown. Position the second cord, at navel height, and make sure it is horizontally aligned to the body. If you want to Order your Configuration, please click on the [Add to cart] button below to add your configurated suit to your shopping cart and then buy it.